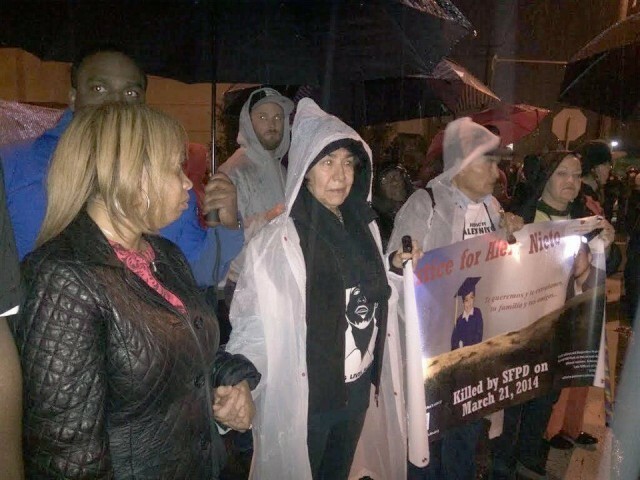 Home » Coast to coast » Justice for Mario Woods! San Francisco — Ever since the Dec. 2 firing squad execution of 26-year-old Mario Woods in the San Francisco Bay View neighborhood by cops, the Black community and its supporters have been in the streets and at City Hall, disrupting meetings and blocking intersections. A newly formed organization, The Last 3 Percent Coalition, and Black Lives Matter Bay Area have worked to support Woods’ family in their struggle for justice. The very name, “The Last 3 Percent,” epitomizes the plight of San Francisco’s Black community, diminished by gentrification. Three now famous bystander videos graphically show Woods surrounded by officers and up against a wall when the firing began. Police claim Woods was carrying a knife. Left, Gwendolyn Woods, Mario Woods’ mother, and Elvira Nieto, Alex Nieto’s mother, hold hands during Black/Brown unity march. Most recently, protesters disrupted the inauguration ceremony of San Francisco Mayor Ed Lee on Jan. 8. Starting with a rally on the steps of City Hall, the demonstrators then marched inside. Refusing to be herded into an isolated viewing room, they gathered on the second floor balcony, shouting “Fire [San Francisco Police Chief Greg] Suhr!” and “Justice for Mario Woods!” Cops in riot gear kept swooping in on the crowd, grabbing signs and any people they could call disruptive. In the pouring rain, there were two marches. One, organized by The Last 3 Percent Coalition, originated in the Bay View, where Mario Woods was killed. The other, organized by the Alex Nieto Coalition, started in Bernal Heights. The two then marched towards each other for a convergence and culminating ceremony. Nieto was killed in a hail of 59 bullets by the San Francisco Police Department on March 21, 2014, when police responded to a 911 call about a “suspicious person.” Nieto, on his way to work as a security guard, was carrying his licensed taser and was far from anyone else when the police confronted and killed him. During a Dec. 24 press conference and rally at San Francisco City Hall, Clarence Thomas of the International Longshore and Warehouse Union Local 10 announced that the San Francisco Labor Council had unanimously passed a resolution calling for the prosecution of the cops who killed Mario Woods. Susan Soloman, executive vice-president of United Educators of San Francisco, said that her union had passed the same resolution. After the rally outside, they marched into City Hall to meet with Mayor Ed Lee. When told he wasn’t in, the crowd promised to come back another day.